How does this organism function? Generally, salamanders have extended bodies with a long tail and legs that are roughly the same size (Halliday and Adler 1986). With cave salamanders, their long tails are prehensile, meaning they can grasp surfaces (Halliday and Adler 2002). Therefore, climbing becomes effortless and brisk (Halliday and Adler 2002). In addition to these characteristics, Speleomantes strinatii do not have webbed feet (Reptiles & amplibiens de France 2004). For more information on this species, you can visit Reptiles & amplibiens de France. 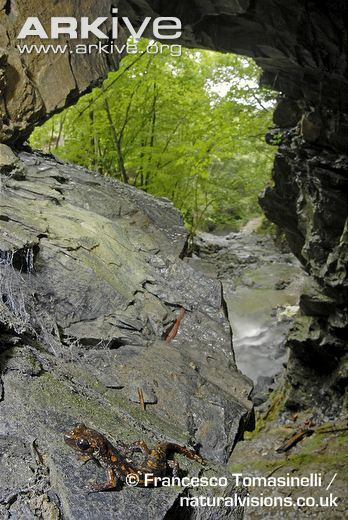 This characteristic allows the cave salamanders to grip the walls and ceilings of the cave (Adams and Nistri 2010). As stated on the Classification Page, the North-west Italian Cave Salamander is in the phylum, Chordata. Organisms in this family possess an endoskeleton for protection, mobility, and support. The endoskeleton of chordates, which includes amphibians, is made up of bone. Bone is rigid and contains living cells called osteocytes. The photograph above was photographed by Francesco Tomasinelli from Arkive.org. 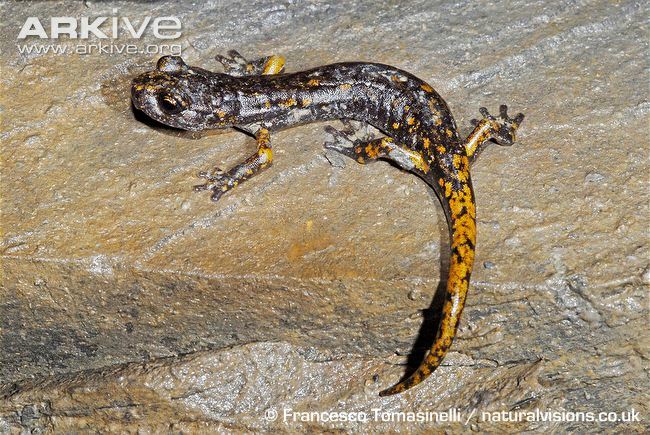 This is a photo of a North-west Italian Cave Salamander. Does this salamander move often? Lungless salamanders have a low metabolic rate. Therefore, they do not have high-energy demands and only survive on small amounts of activity (Halliday and Adler 2002). Any movement of these salamanders is typically followed by a prolonged period of inactivity (Halliday and Adler 2002). Lungless salamanders do not require frequent feeding periods because of their increased capacity to store their food as fat (Halliday and Adler 2002). To learn more about what these salamanders eat, visit the Interactions Page. Why do North-west Italian Cave Salamanders live in moist environments? As mentioned on the Habitat and Geography Page, the North-West Italian Cave Salamander is a terrestrial salamander and usually resides under rocks and logs, and in the soil (Salvidio 2007; Halliday and Adler 1986). This salamander is classified in the family, Plethodontidae, which means lungless (Halliday and Adler 2002). This family makes up 70% of the order, Caudata or Urodela (Carranza et al. 2007). Because Speleomantes strinatii is a lungless salamander, its skin functions as part of their respiratory system (Halliday and Adler 1986). Its skin needs to be moist in order to absorb oxygen; therefore, this species is only found in damp environments (Halliday and Adler 1986). Also, Speleomantes strinatii is a stenoecious species, which means that it survives only in environments with high humidity (Ficetola et al. 2012). In times of wet weather, this species may arise from their moist concealed places (Halliday and Adler 1986). This usually occurs at during the night in search of a mate or food (Halliday and Adler 1986). To learn more about the mating of these salamanders, visit the Reproduction Page. The photograph above was photographed by Francesco Tomasinelli from Arkive.org. This is photo of Speleomantes strinatii in a cave. Speaking of food, how does this organism digest its food? Speleomantes strinatii has an extracellular digestive system, where digestion occurs in the gastrovascular cavity. Furthermore, the food is moved down to the pharynx, where enzymes catalyze the particles into smaller pieces. The nutrients from the food are used in the blood or other bodily organs and systems. Unlike organisms with intracellular digestion, extracellular organisms have a separate respiratory system. What type of circulatory system does the North-west Italian Cave Salamander have? Chordates, including Speleomantes strinatii, have a closed circulatory system. This means that this organism has a heart, arteries, veins, capillaries, and blood. Veins take blood away from the heart, while arteries bring blood to the heart. The heart acts as pump and consists of many circuits and chambers to help with the flow of blood to the rest of the bodily organs and systems. Isn't it fastinating that this organism has no lungs? Click here to learn about how the North-west Italian Cave Salamander reproduces.